In this week's blog, we take a look at subscriptions. Although it has always been around, many companies are now looking towards subscription models and tiered pricing in order to preserve or improve their market share. Let's take a look at some reasons why that is. It's so very easy to forget about the benefits offering subscriptions to your customers when looking at rolling out new or more innovative products, but as the shift in the United States has begun to skew towards longevity and multiuse, more and more companies are looking towards subscription-based services when creating goals for their company. With the rise of more and more complicated technologies and products, never has there been an opportunity to serve your customer base (not to mention yourselves and investors) by giving them exactly what they are asking for at a price you can both live with. Not very long ago, one of my favorite products went from version-based purchasing to a subscription model. To say that I was unimpressed really would have been an understatement, but as the months have ticked by I've noticed a few things that have completely turned me (as a consumer) on the notion of a subscription service. Firstly, there's the stupid simple convenience of putting ten bucks a month on autopilot to ensure that I always have the latest and greatest version of the software that I am using. As a certifiable type A personality, I cannot explain the peace of mind it gives me to know that the services or product I need to my work are prepped and ready for me--always. Another value I get from my subscriptions (it always starts with just one) is that it allows me greater flexibility with my personal budget. I have personally found it easier to meet financial goals and save for big ticket items because what was once considered a big ticket purchase for me has now turned into a palatable monthly fee. In face, there are now services that allow you to skip months or pause your subscription if you find that you don't need certain tools while you are on vacation, for example. Lastly, I have found that most companies offering some type of subscription service will often bundle additional products or services at little or no additional cost. This is a huge deal for a growing number of consumers that are looking to squeeze as much value from their purchases. For example, once upon a time, I was resigned to spend hundreds of dollars on Adobe products. Then they began bundling them, which helped with some of that burden, but now I instead pay a fraction of what I used to for more programs than I can shake a stick at...all for a fraction of what I used to pay. Possibly one of the best benefits one can hope to expect from adopting a subscription model is a newfound ability to accurately predict revenue from recurring sales. A lot of what goes into keeping your business successful revolves around having accurate business data. Being able to track and forecast revenue can provide a clear idea of how to manage inventory as well as providing points of reference for reordering. Another key benefit for businesses looking to switch to subscriptions is that it allows a company to provide laser-focused services and products to their customers. One of the easiest ways to turn off a customer is to overwhelm them with choices. Subscription services don't normally have that problem because the consumer is typically getting exactly what they want. This may mean that a company can trim underperforming services and products allowing for a simpler backend while simultaneously providing your customers with a focused, efficient transaction. This can of course, extend to simplifying other parts of a business. For example, a benefit that some companies bank upon when considering the switch is the simplicity of it all. For the business, they only need to sell what their customers are interested in, but in addition it may also make shipping easier as you will always be able to predict and order only what is needed for your business. Additionally, since most of the work is done prior or at the onset of a subscription service, the majority of the process from interest to sale is automated, freeing up valuable resources to concentrate on other aspects of the business. Any way that one wants to look at it, subscription-based models offer many tantalizing benefits that companies should be seriously looking at. We've only just begun to look at some of the possible benefits, but by and large, consumer are beginning to show a willingness and desire for subscription services and products and many businesses on this model report that customer engagement, conversion, and retention have grown explosively after a switch. 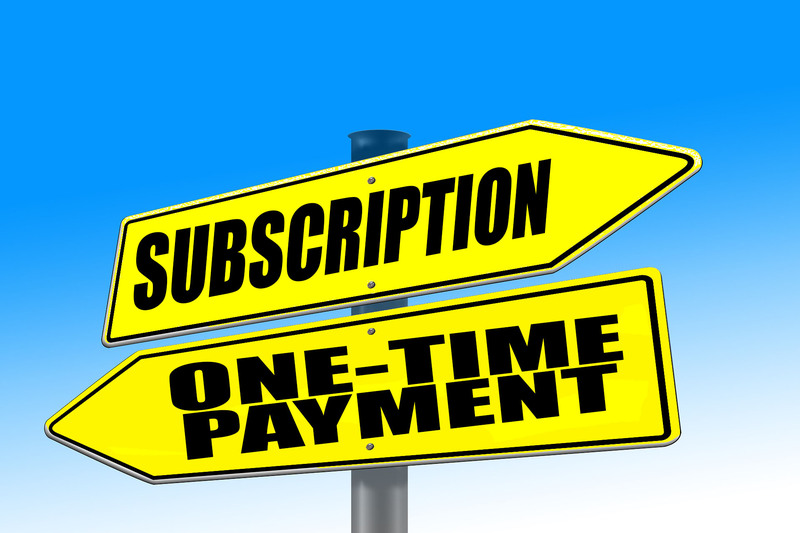 Many suggest that subscription models are a means to quickly shuttle between clients or customers, but I think that the opposite may in fact be true. Once the initial work has been completed, the service-provider then may then be able to strengthen that relationship by offering what feels to them like a catered and personalized experience. It encourages trust as service providers must now ensure that they can consistently provide those services at any time for the client. Clients with project based relationships with their service providers are an avoidable loss; by switching a customer's focus from completion of a project to one that focuses instead on ongoing objectives, a company can more easily innovate and explore ways to provide a better product or service to their customers. Without a doubt, the 2017 Major League Baseball season has been one for the record books. Currently, the leagues is poised to shatter the average home runs per game average of 1.17 by almost a tenth of a point (MLB average stands at 1.26 home runs per game at the moment). What this means is that if the league continues this pace, they will effectively destroy the previous single season home run record from 2000 by an impressively mystifying 350 additional homers (roughly 6400 homeruns). And although layman's logic would point towards advances in science or athlete training as the culprit, what many researchers are now finding is almost equally amazing: the baseballs themselves are at least partially responsible for the increase and it's due to inconsistent manufacturing. The baseball wasn't initially expected as the source behind the recent spate of homers in the Major League. Last year, Ben Lindbergh and Rob Arthur began looking at the data to understand the sudden spike in home runs around the league. 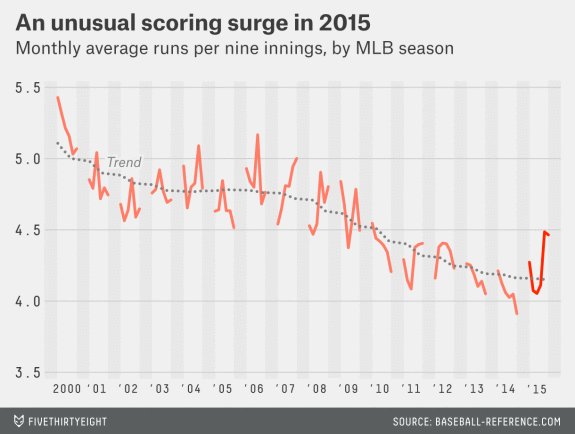 Beginning in the '09 season, the average runs per game inning to decline, from 4.7 runs per inning in '08 and eventually falling to 3.9 by the end of 2014. Something strange was happening in 2014, however. At the end of the season and into the postseason, teams that were still alive saw their runs spike from 4.06 at the beginning of the season to an average of 4.25 by the end of the season. Then in 2015, things got more interesting. 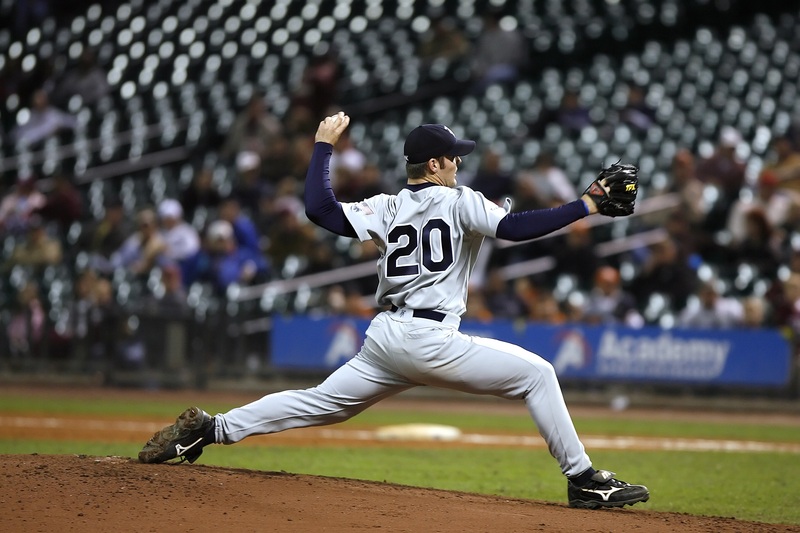 Initially, 2010 was thought to be the "Year of the Pitcher", with many observers and commentators praising the explosion of talent at the mound for producing runs at a much lower rate than they had in any full season prior to 2010. So when the 2010 season kicked off and we witnessed an explosion of home runs that couldn't be attributed to anything like an increased strike zone or increased percentage of contact (at-bats minus strikeouts). What turned out to be the actual cause would take insiders and observers almost four more years to understand. The culprit, as it turns out, was the ball itself. In June, Mitchel Lichtman and Ben Lindbergh started studying the official game ball in an attempt to understand what may be contributing to the spike in homers. Through experimentation on more than three dozen baseballs, they found what they had begun to suspect: the baseballs from 2015 were "bouncier" than previously. As they continued to look at historically used game balls and evaluate newer game balls, they noticed that the physical makeup of the ball had seemingly changed. 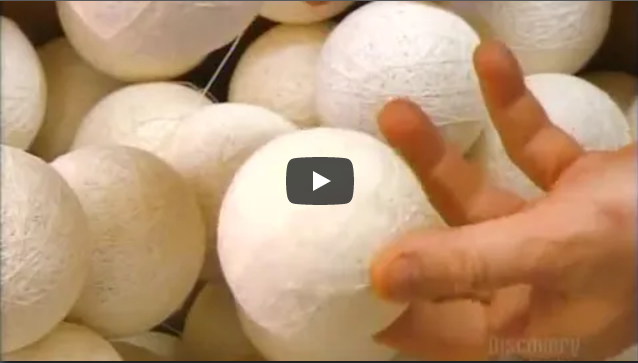 The new balls were now smoother and the seams smaller, subjecting the ball to less air resistance. Additionally, the team found that the balls had begun to become "harder" providing for a better energy return when struck with a bat. The "problem" was that there was no announcement of changes being made to the official ball. The MLB for their part have denied that any such changes were made to the official game ball and that all materials currently in use are identical to previous generations. They also note that all game balls must fall within the league standard, which may have been left purposely wide so as to retain some unpredictability to the game. Anecdotally, players and coaches also seem to believe that a change has been made to the ball. In a recent interview with the Orange County Register, New York Mets manager Terry Collins said "The seams of the ball are definitely lower...and there is no question that the ball is harder." His voice joins that of Jake Arrieta ("I'll get a ball hit back that is oblong shaped and that never happened until this year"), Andrew McCutchen and pitcher Justin Verlander who have all mentioned changes to the official ball in recent months. So what does this have to do with inventory solutions? Well in a nutshell, this is a pretty low-stakes example of the importance of consistency in your products. Small changes can have large impacts and in other cases could open your business up to unwelcome or unexpected attention. Having solid, reliable, and well-documented bills of material and assembly instructions could mean a world of difference and might help as a source of information if you are just now beginning to establish standardization across your products. What the moneyball data seems to suggest now is that after years of fluctuation, the performance of game balls is beginning to become consistent. By evaluating the standard of deviation in drag over the last few years, the trend is that the balls used across the league have become much more homogenous in their performance. One could suppose that with the league disavowing any knowledge of changes to the ball or the standards by which they are evaluated, the entire incident could be chalked up to a decade-long trend to bring standardization to baseball with an acceleration within the past two years pointing towards a game ball that would perform predictably game after game.